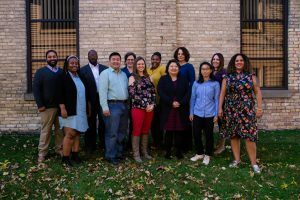 Nexus Community Partners seeks a full time Director of Human Resources and Organizational Culture, (40 hours a week, Monday-Friday), to join a dynamic staff of thoughtful, equity-driven individuals who are deeply committed to the organization’s values. Nexus Community Partners is a community-building intermediary whose mission is to “build more engaged and powerful communities of color by supporting community-building initiatives and foster social and human capital.” Nexus addresses the deep isolation within communities of color and Indigenous communities caused by personal, institutional and structural racism by promoting an equity centered engagement model; supporting the development of leaders; democratizing wealth; and by reclaiming culture as an asset. The Director of Human Resources and Organizational Culture will provide leadership to foster a collaborative and inclusive culture at Nexus Community Partners, a workplace with people who have diverse backgrounds, viewpoints and experiences. The Director will work with the President/CEO and executive leadership team to help staff members continually develop in their jobs, learn from the communities we serve and contribute in a high-performing environment. The Director will plan, direct, coordinate, and manage the human resources functions of the organization. As a member of the executive leadership team, this position will be a strategic partner in planning organizational goals, and serve as the primary contact for employee support to all levels within the agency. Maintain a schedule of facilitation and coaching activities that support individual, team and organizational development needs and; conduct or procure specific trainings, assessments and/or related workshops. Design and implement inclusive recruitment and selection processes and evaluation systems that drive the growth and effectiveness of the organization’s staff, including internal advancement. Develop and implement all aspects of hiring and onboarding to ensure that staff members are effective and efficient in their jobs, and that they gain a broad knowledge of the organization’s operations and culture. Lead intern staffing. Including needs assessment, recruitment, creating job descriptions that foster leadership and personal growth. Manage market competitiveness assessments and recommend compensation strategies that invest in current staff, attract new talent and retain strong teams. Ensure compliance with legal requirements and best practices. Manage the day-to-day operations of the Human Resources department. Ensure security and accuracy of employee records, consistency of practice, and maintenance of optimum service levels. Provide consultation and training to managers and supervisors to address employee relation matters (especially for cross-racial, cross-gender/gender-identity, and cross-generational supervision). Collaborate with the organization’s finance department on inter-related financial and transactional elements of Human Resources, including payroll, compensation and benefit administration. Ensure compliance with HR legal and regulatory requirements, standards and other relevant HR policies and guidelines. Liaise with outside legal counsel as appropriate. Ensure up-to-date job descriptions and classifications with necessary functions and competencies are in place at all levels. Direct and implement agency’s performance management system to ensure effectiveness, compliance and equity within the organization. Keep informed and up to date regarding industry standards and best practices related to non-profit personnel management. Manage fringe benefit system, including enrollment, termination, changes, open enrollment and COBRA. Manage the organization’s paid time off tracking system; ensure payroll product is a good fit for the organization. Prepare and process payroll, including electronic employee record maintenance. Create and produce payroll based management reports, and annual salary survey reports as requested. Develop, manage and implement personnel policies in the HR Handbook. In partnership with the President/CEO and the executive leadership team, lead efforts to gather and understand staff input and create actionable steps to further improve organizational culture, create an environment that fosters continual learning, and staff who are engaged and energized by the work they do. Create compelling, people-centered, engagement and learning opportunities that help all staff members experience the benefits of inclusion for themselves, colleagues, the organization, and the communities we serve. Demonstrate a willingness to explore non-traditional HR mediation and relationship building practices. Create internal activities, processes and resources to help navigate personal conflict(s) as well as manage grievances/mediations (or create a plan for external assistance). In partnership with all staff, develop and foster a culture of accountability in interpersonal relationships, organizational processes, decision making, and community relations. Manage, evaluate and expand organizational wellness program, with on-going input from staff. Organize organization-wide staff engagement and team building events. Work in coordination with the President/CEO to support the work of the internal equity/inclusion and/or culture caucuses, and continually improve the organization’s equity/inclusion work with an intersectional lens that goes beyond race, (race, class, gender analysis, etc). Represent the organization at conferences and in the community to build relationships and awareness of our brand and culture. Work closely with the executive leadership team on overall HR quality efforts, and setting short and long term goals for the organization. Build trust with employees and be an active listener and effective solver of people issues. 8 years’ experience in a leadership role with considerable knowledge of principles and practices of the human resources field, including compensation, benefits, employee relations, recruitment and selection, training and development, performance management, employment law and compliance. High level of personal and professional integrity, including ability to protect and maintain confidentiality. Proven ability to coach and mentor individuals and teams with a high level of emotional intelligence. Solid judgement, problem-solving aptitude, flexibility, creativity, diplomacy and appreciation for the organization’s mission and values. Ability to communicate and influence at all levels of the organization. Demonstrated leadership ability and an ability to influence others directly and indirectly. Demonstrated ability to work and communicate effectively with people of diverse economic, racial and cultural backgrounds. Ability to see possibilities and to ask hard questions with respect and discretion. Openness to growth and learning. Can operate with a systems and systems change view and approach. Proficient computer skills including Microsoft Office programs (Excel, Word, Power Point) applications. The ideal candidate would be able to start mid to end of March. Salary range: $75,000 to $80,000 annually, plus a comprehensive benefits package as a full time employee. Nexus offers two health insurance options and pays for 80-90% of the coverage for the entire family. Employees receive 6 holidays and 6 optional holidays, and PTO. Nexus has a wellness program that offers 2 hours of wellness time each week, $500 of reimbursable wellness dollars each year, and staff wellness events. The Director of Human Resources and Organizational Culture will report to the President and CEO.